I watched the final of The Apprentice last night on BBC1, where four lucky hopefuls pitched their business ideas to Lord Alan Sugar and his trusted confidantes, to help him decide who should win this year’s prize of a business partnership with Lord Sugar and £250,000 investment. It was nice to see that two of the four finalists have a background in the beauty industry: Tom Pellereau is a health and beauty inventor who had previous success with bringing Stylfile, a curved nail file, to the UK beauty market through Superdrug, Boots, Tesco and Walmart – no mean feat for a person who doesn’t consider himself a salesman to persuade these beauty giants to stock his product. 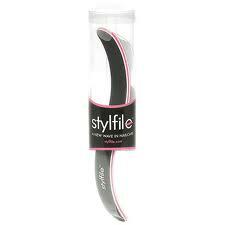 I remember writing about Stylfile in one of my very first months at Pure Beauty magazine, back in 2004! I seem to remember Stylfile getting bought out by another company and then disappearing from view altogether, although after all of its coverage on The Apprentice, whoever owns it now would be crazy not to re-launch it. In any case, they still have an active website at http://www.stylfile.com. Meanwhile, fellow finalist Susan Ma already has her own natural skin care range, Tropic Skincare (http://www.tropicskincare.com), which she started from a market stall. I’ve never heard of it before and I don’t know if it is available anywhere other than her website; either way, the official Apprentice website bumph about Susan says that “she has now turned [it] into a lucrative business”. I was impressed with Susan, who has achieved so much for her young age of 21. Her constant enthusiasm was refreshing and I have no doubt that we will see more of Susan in the beauty industry. I thought it was a shame the panel didn’t dig deeper into what Susan's beauty range would offer; I was keen to know what the USP of her products was. Tom Pellereau was the eventual winner of The Apprentice, although I doubt Lord Sugar will go ahead with Tom’s proposed business plan of a chair that detects and aids back problems, as he seemed less than keen on the idea. Interestingly though, on the after-show – The Apprentice: You’re Hired, Lord Sugar said that he has always wanted to enter the cosmetics market (I suspect that the super-high margins make the beauty industry an appealing prospect to investors, as Dragon’s Den's Gavin Duffy previously told me here). Lord Sugar also mentioned that he was impressed with Susan Ma and would be interested in having her work alongside Tom, so I would be less than surprised if Susan and Tom will be making headlines in beauty in the future. What I think would really make The Apprentice shine as an inspiration to entrepreneurs is if it now follows and televises Tom and Lord Sugar's (and Susan's?) journey as they embark on their partnership. Not only would this give a real insight into the creation and development of a business, but it would also provide very powerful marketing for the products they eventually launch. BBC and Lord Sugar, are you listening? Great idea - I would certainly watch! I was also really impressed with Susan and think she's an inspiration to aspiring entrepreneurs.